THE BEST SEAGRASS BELLY BASKET YOU’LL NEED TO BUY!!! 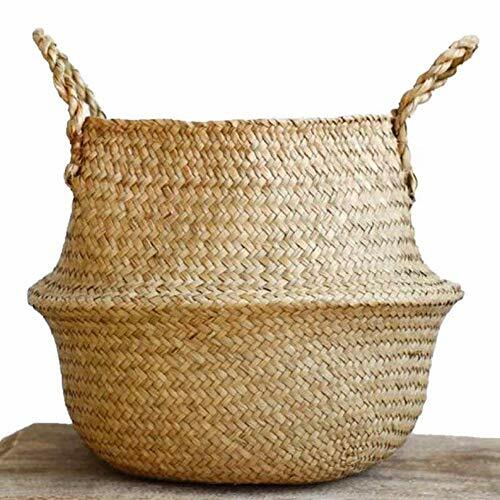 Do you want to buy a seagrass belly basket for yourself, and gift a set to friends and family for storage device for clothing and towels, pillows and toys, and can also work as an unique plant holder, pot holder, basket planter for cactus, fiddle-leaf fig, snake plant, etc? You have a strong desire to improve your lifestyle! ✅ GREAT HOUSEWARMING GIFT - Fill it up with goodies to make an ideal housewarming gift, hamper or baby shower bundle. ✅ MULTI-PURPOSE BASKETS: It can serve as a storage device for clothing and towels, pillows and toys, and can also work as an unique plant holder, pot holder, basket planter for cactus, fiddle-leaf fig, snake plant, etc. ✅ 100% ORIGINAL NATURAL SEAGRASS AND HANDMADE: NaturalNeo Seagrass Belly Baskets were hand-woven by Local Artisans in The Southeast Asia. The color of the seagrass basket is nature, no painting, no chemical. Would you agree you need one of our seagrass belly basket? could you see the benefits of seagrass belly basket? Are you serious about changing your habits? Do you think now is the right moment to make a change? ✅ 100% ORIGINAL NATURAL SEAGRASS AND HANDMADE: NaturalNeo Seagrass Belly Baskets were hand-woven by Local Artisans in The Southeast Asia. The color of the seagrass basket is nature, no painting, no chemical. If the basket you received is more green, that is because we use season new seagrass. but it will slowly turn to yellow especially when long time under sunshine. ✅ MULTI-PURPOSE BASKETS: It can serve as a storage device for clothing and towels, pillows and toys, and can also work as an unique plant holder, pot holder, basket planter for cactus, fiddle-leaf fig, snake plant, etc. NATURALNEO baskets were collapsible and stackable when not in use. Can be folded inwards or used as a hand carry basket. ✅ DIMENSION: LARGE: Centre Diameter 35cm/14 inches, Height 35cm/14 inches. Please check size carefully before buying. ✅ 100% SATISFACTION GUARANTEED: Our business rule is "100% Satisfaction or Money Back - No Questions Asked" and let us know! Click 'Add to Cart' and 'Buy now'!